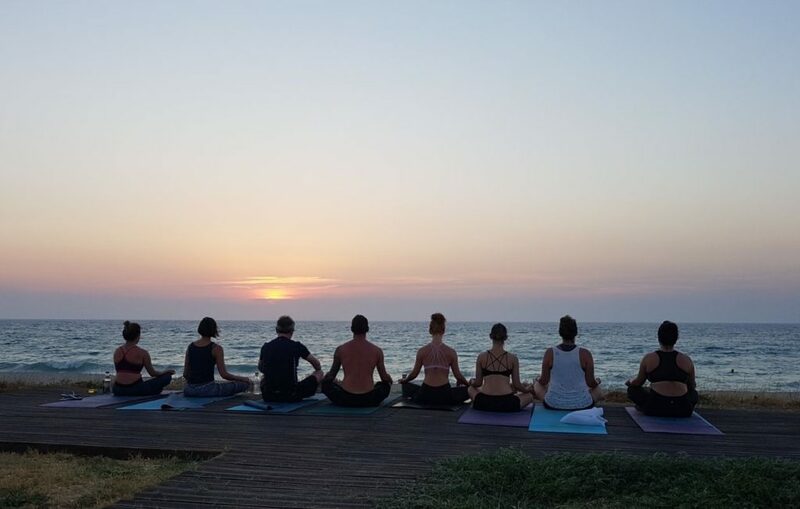 If you’re looking for a relaxing holiday I can highly recommend the yoga retreat I went on in Corfu this year; yoga on the beach in the morning and as the sun goes down at the end of the day. I’m not sure whether she’d said it because of my ailments, but it landed with me straight away. Unfortunately, for my tennis elbow, it had come a bit late as it had been screaming at me since before Corfu; but it was a godsend for my Achilles, which was still a whisper. From that point on I made sure I listened to my body and paid attention to the whispers coming my way. Since coming back, I’ve been paying attention to the whispers my body sends and doing what I can to reduce the screams. But what has been most interesting is how the whisper to a scream idea has echoed around me. Initially I didn’t get the connection, but eventually the signals became too strong to ignore. I was chatting with a close friend over lunch one day – you know how you do, bouncing between different subjects – and then I asked how work was. Well, I’d opened up a can of worms; she let rip. If only someone could get the MD of her business, of which she’s a member of the senior management team, to see that he’s the one driving the instability and uncertainty the team were feeling. Sure, he can do the job because of his years of experience, but his procrastinating and support of ‘cliques’ was actually dividing the team and causing a loss of focus. I asked if she felt able to have a private conversation with him about this. She said she was nervous of damaging her reputation with him and potentially being seen as an emotional woman if she brought this up in what is otherwise an all-male executive team. That same day I was sat next to someone at a barbeque and they were talking, with a heavy heart, about how they weren’t sure they’d continue to be do a major charity event they’d been involved with for years. The new Chair of the event was completely unaware of the impact her behaviours were having on the other volunteers around her. She had a ‘short’ way of speaking to people which often led to them feeling undervalued or talked down to. Apparently, several other volunteers were also considering whether or not to be involved. A day or so later, another friend was chatting to me about work and started complaining about how the overall mood of his work place was suffering due to the way people were being spoken to by a key person. He reckoned that there was going to be a big bust-up, where some honest words (not exactly his choice of words) were going to be spoken, enabling the truth’ of the situation to surface and when the dust had settled it’d be OK as they’d be able to address the issue more calmly. I asked whether the ‘bust-up’ approach was the best way forward, to which my friend replied, “It’s the only way she’ll hear what needs to be said. To be honest, it needs someone to sit us all down and mediate a resolution.” Again, not his exact words. And, recently, a consultant friend of mine said she was at the end of her tether with a situation on a job she works on. She said she’d given so much to the project and seen two lots of people come and go on the team; people who’d given so much and been willing to explore where an idea might go. As I listened, she went on to explain that she was beginning to realise that there was one person who’d been a constant factor during her two years on the project, one person who was very good at pointing the finger in other directions. It had become apparent to my friend that this person who was the central cause of the problem. Unfortunately, this person happened to also be the founder of the business, and had a strong personality. And this is why I’ve written this article. Because many organisations need to get better at listening for whispers; but it’s more than that. They need to empower people to have conversations to avoid those whispers building and becoming destructive. Research by the Career Innovation Group established that many organisations suffer with what they named ‘The Conversation Gap’. The research aimed to establish what it is that makes people feel valued at work, what makes them give that little bit more and want to stay committed to an organisation. And the magical elixir? Honest and responsible communication. People being willing and able to talk to each other. If people work together they are in the same physical space as each other, but if they’re not able to have important conversations it creates an emotional gap between them: the Conversation Gap. Employees are so disengaged, they are three times more likely to be planning to leave their jobs in the next 12 months. And this is borne out in many an exit interview, when people feel brave enough to reveal the truth about why they are leaving. People often leave because of the people they work with; and the reverse is also true, that people stay because of the people they work with. Organisations are made up of people; people are what make an organisation work. If people are hindered in their ability to speak the truth, an organisation becomes ineffective. If you’ve ever driven a car with the handbrake on you’ll understand this analogy. The car moves, it turns, it stops, but, somehow, everything just feels restricted and wrong. People’s inability to feel they can say what needs to be said, their whispers of dissatisfaction, are the handbrake which slows the business from being as effective as it can be. I’m sure many of you have an experience of how ‘whispers’ rather than conversations affect the mood of people and their efficiency and productivity. You see, it’s not that people aren’t talking, they are; just not to the people they should be talking to. They’re whispering their discontent to each other. They’re whispering to you and me outside of work. And, if they carry on, that’s when whispers turn into screams. Managers are the ones who role-model behaviours for others to follow, the ones who set the tone, so there’s a lot of responsibility, but there is also a lot of things you can do to prevent the scream erupting. Give people opportunities and responsibilities (let them shine). ‘If you listen when your body whispers, you won’t have to hear it scream’. People are the bodies in your organisation, and these whispers are real. I’m hearing them. We all hear them – particularly when it doesn’t matter to us personally. Be willing to steer in the direction of having these conversations. Make willingness to listen a cultural thing and you’ll reduce the potential screams.